In a world dominated by Disney and Grimms’ fairy tales, a few classics still stand out and continue to be made and remade both in its original format as well as with a modern touch. Lewis Carroll’s ‘Alice’s Adventures in Wonderland’s charm has not faded with the years as the story has inspired a huge body of work and mediums which are beyond the realm of children’s literature. It has become a favourite not only among children but also with adults due to its imaginative powers and logic. It has often been considered as one of the finest fantasy work ever penned in literature history. Giving the tale a new and contemporary setup by bringing the story to the modern time zone renowned playwright Jonathan Yukich has brought Carroll’s creation to the familiar setup in the 21st century. This version aptly titled ‘[email protected] Wonderland’ shows Alice as a typical teenager who is bound to modern technology. She tries to use this knowledge to escape from Wonderland but ends up in hot water with the Queen of Hearts. 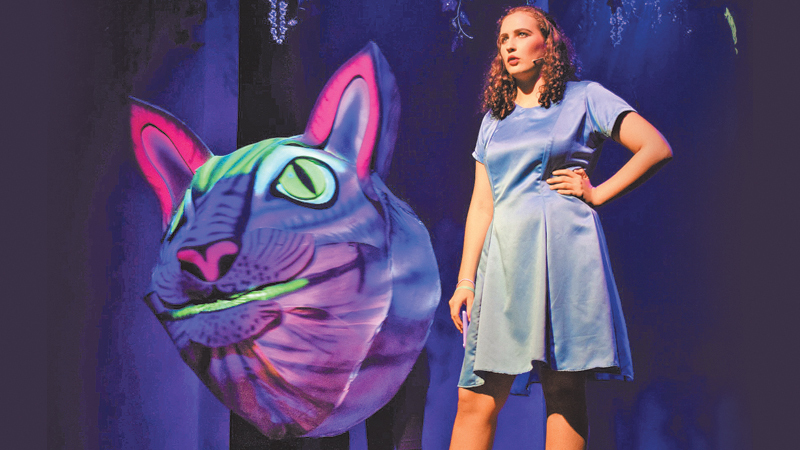 Directed by Anushka Senanayake a cast of over 50 students from Elizabeth Moir School took to the stage at the Lionel Wendt Theatre as they brought the wonders of the tale before Sri Lankan theatre enthusiasts. Comprising of dance performances choreographed by Melissa Fisher, the story brings to life all the well-loved characters included in the original tale from the White Rabbit to the March Hare, the Mad Hatter, Humpty Dumpty, Twiddle Dum and Twiddle Dee and the Queen of Hearts. An enthralling scene of dancers clad in costumes representing greenery sway to the sounds of nature’s call as the curtains is drawn for the show. As the sounds fade away we are introduced to Alice who is hooked to her new mobile phone and is too engaged in conversation with a peer to notice the White Rabbit scurrying past. She, however, is brought back to earth when she notices that her phone battery is about to die. Her need to charge her phone rather than her curiosity about the talking rabbit lures Alice down the rabbit hole. There she meets many curious and wondrous creatures like the blue Caterpillar smoking a hookah and the grinning Cheshire Cat. She also stumbles upon strange experiences like having to drink and consume certain items to reach the necessary size for her to fit the Little Door in the Hall of Strange Doors. The drama team fittingly lowers the treats and the keys so that they create an illusion of magically appearing in the background as the action takes place on stage. One of the highlights of the production is the entrance of the Caterpillar. The feisty creature being wheeled in while she is sprawling on a giant mushroom while smoking hookah is a visual treat for the audience and sure enough, the sight her entrance is greeted with much enthusiasm. The exchange between the two is also rather catchy and significant as both are at the brink of stepping into a new stage in their life. Other episodes like a Toad and Fish selling newspapers and the talking flowers bring on more smiles. The scene of the Mad Hatter’s Tea Party is another enchanting episode which is excellently dished out by the actors. The scenes change without any disturbances and shifts to the next naturally. A noteworthy fact in the production is the use of props which have been exquisitely designed not only to fit the storyline but also to woo the audience. The entrance of a Papier-mâché version of the Cheshire Cat makes us sit up and take note as it sets off a haunting atmosphere within the scene’s lighting and sound setups. The carefully designed costumes too are flawless. All the students have memorized their lines down to a pat and their performance flows naturally. 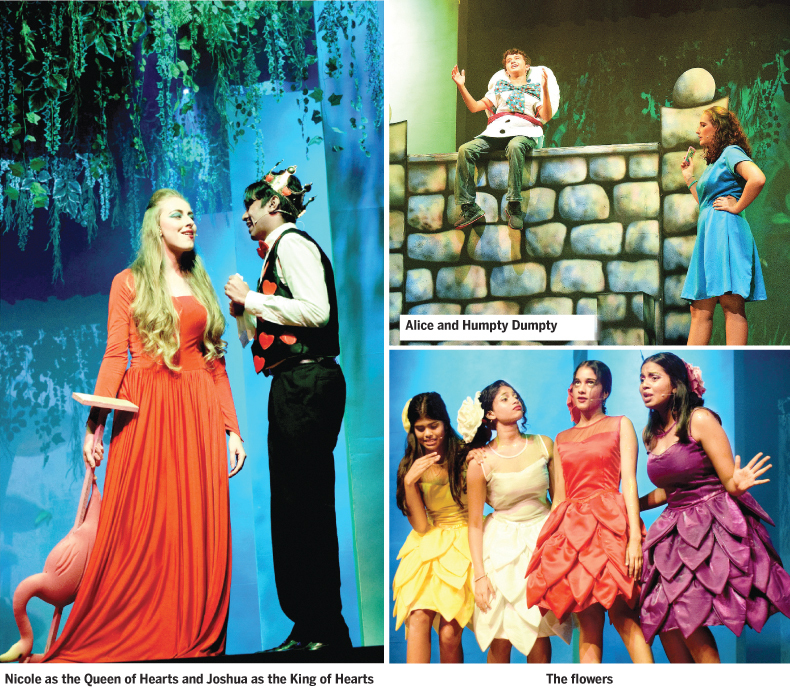 Each and every actor has done his or her bit to contribute to the allure of the play. Kudos to the cast and crew for their dedication in staging a show which has managed to capture the audience and keep them entertained till the end.